Enjoyed both of them. 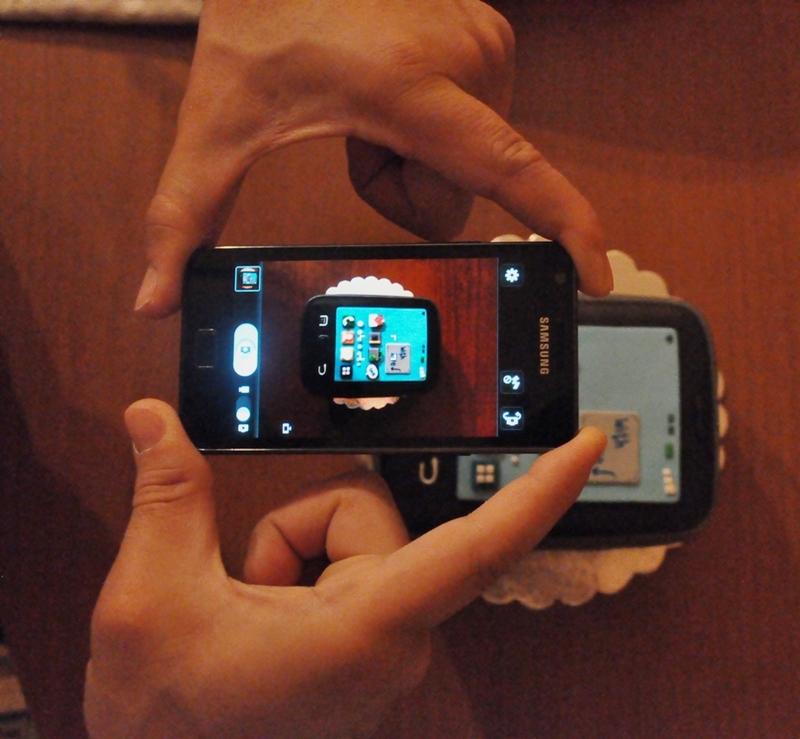 The phone and the cake! Thanks Mo for being so thoughtful! I have a confession. Though I love traveling, I didn’t visit that many Arab countries, mainly it was a day in Syria (in a coastal city I don’t recall its name) and a day Beirut, that were part of a Mediterranean cruise I did in 1999 ! So when I made up my mind to take this trip I was particularly excited. First, to meet my family members who lived there, second, to broaden up my traveling list. This whole trip started with a mere conversation with a friend of mine 5 years ago. We were talking about preserving knowledge, and how documenting family heritage is crucial to preserve our identity, and we talked about my own family history and its voyage from the Caucasus. This led to prolonged conversations with my father, and we draw some sketches of our family tree, and he helped me with some information on his grandfather who came to egypt in the late 19th century. Then I dig in my grandfather’s papers, and found among the yellowed paper, some letters, when he used to correspond with his cousin (and closest friend). And through these letters, I was touched with the amount of brotherly bonds between them, and the extent of which they were on the same track of thoughts and general attitude, that it felt like having another grandfather, who grew up in Cairo, but decided to settle down in Amman. hard! It was a sign that this family connection is meant to be refurbished. When I landed in Queen Rania airport, it took me a while to get to acquainted with the new Arab slang I was hearing. A friend of mine once told me that when he first landed in the US, he was shocked to find himself not understanding English for a couple of hours despite the long years of using it in Egypt! Where is the Babel fish when you need one?? Before leaving the airport, I was greeted with a huge billboard saying: tagawal ma3a shabaka amneya (walk around with a security network!). Okaaaay! So I was leaving Egypt behind with some instability, only to go to amman where they advertise on body guards companies in the airport! Then, I discovered that it was not “Amneya: security”, but “Omneya: wish”, the name of a mobile operator! 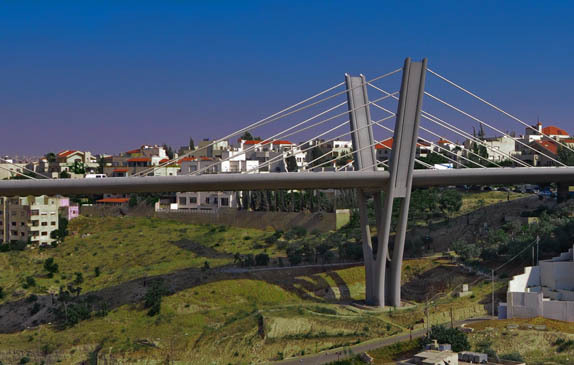 So the phrase actually meant: Roam with Omneya’s network! sigh! Needless to say, I enjoyed every single moment of my visit. it didn’t feel like it was the first time to meet these wonderful people. It felt more like we knew each other all along. I was very grateful for having all these loving aunts. Perhaps I was more so, because of my new motherhood feelings, which prompted me to re-establish “selat el ra7em”. I find the Arabic word much stronger, because at the end there is some common blood between me and them, and it all started with one woman, only 4 generations ago, who gave birth in a noble house somewhere on top of the cherkessk mountains. The first thing that came to my mind when I was invited for lunch and asked what type of food I want, was -of course- the sharkasseya. For if I was invited by circassians, I definitely should taste their original version of the famous dish. El Sharkasseya (or Chipsobasta) consists generally of 3 different parts: rice, chicken and walnut sauce. There are very few differences between the original and the one we make in Cairo. for instance, they sprinkle some chili sauce on top of it, we don’t. They mix rice with borghol, we use only rice but add a tinsy bit extra water. They use the whole chicken, we use only the breasts. We use bread for the sauce, they use flour. I also tasted the circassian cheese, which is kinda similar to the low fat “gebna 2arish”, but with a bit more salt. As a sword enthusiast, I was gladly shown some circassian swords (called Qamah). It is said that every family should have at least one sword and one dagger, which makes sense looking at the tendency of circassian for learning how to fight. the circassian sword is straight, and its thickness is average. In the ones I saw, the cover was silver , with some simple drawings. It looked practical, and not too heavy. Amman is a new capital, it was built in 1920’s, on the ruins of an old city called Philadelphia, which was on the road of commerce between the Arab penninsula and Syria. And bit by bit, it grew bigger and bigger along a number of squares (called دوار ) and several hills. These squares are numbered from 1 to 8, and are used extensively in giving directions. 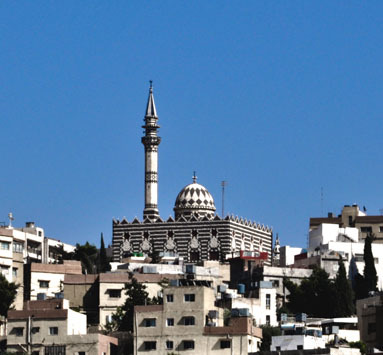 And as a general advice, try to visit both the eastern and the western neighborhoods of Amman to get a feeling of the City’s vibe. 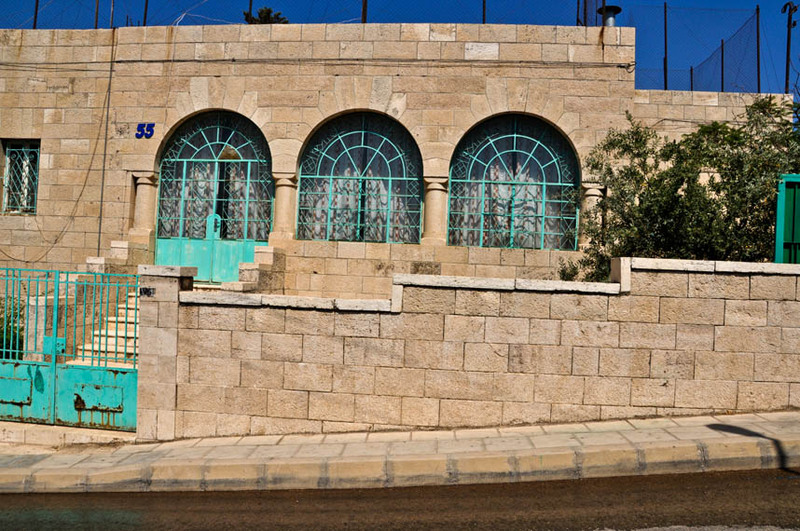 In the Area of Jabbal Amman, off the first dowwar lies in the old parts of Amman, and close to it there is the famous Rainbow street, with a bunch of cafes, crafts shops,,, etc. Also, in the vicinity is the Roman Amphitheater, and the Citadel. On Fridays, check out Souk Jara, it opens from 10 am to 10 pm, it has lots of booths showing traditional crafts, antiques, textiles,,, plus some food and drinks outlets. It has the same feeling of our El Korba festival, but much quieter. Amman itself won’t offer you lots of historical sightseeing, but some short excursions will immerse you in ancient monuments. I had the chance to visit only 2 sites (Madaba and Mount Nebo), and I was back in Amman in less than 4 hours. 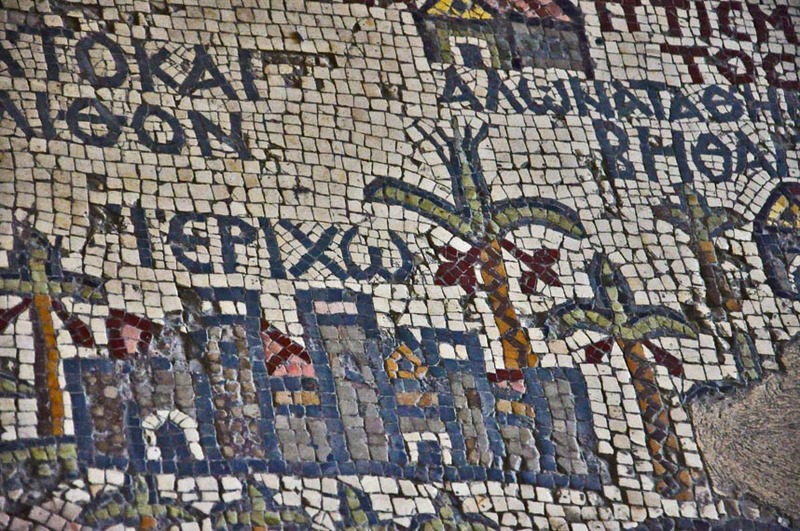 Madaba is famous for its 6th century AD mosaic map, which is the oldest surviving original cartographic depiction of the Holy Land and especially Jerusalem. 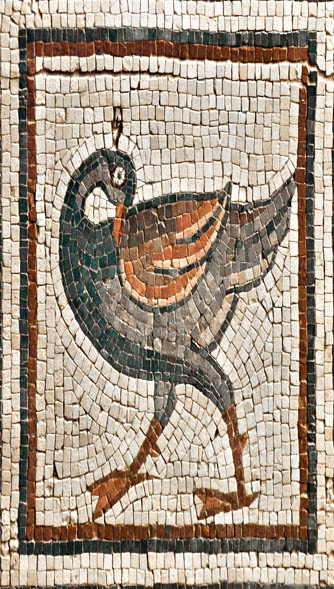 Mount Nebo is approximately 817 meters above sea level. And when you get to the summit, you can have a panoramic view of the Holy Land. 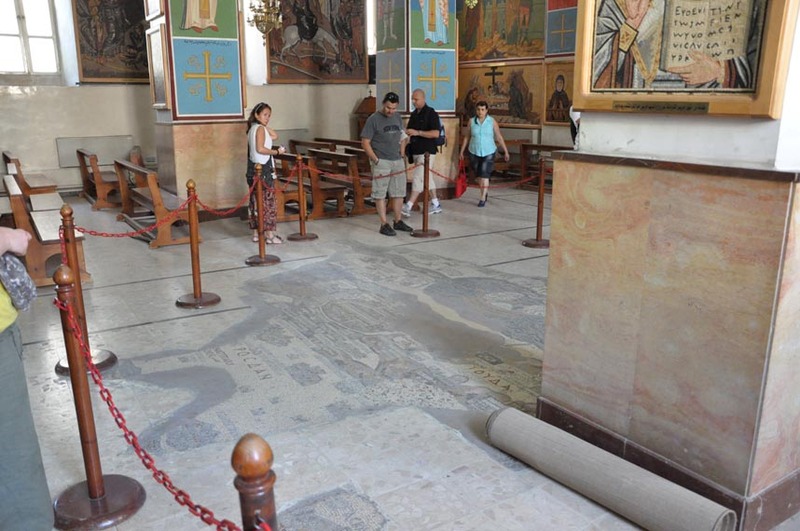 It is famous in the Christian and Jewish tradition cause it is considered that this is where Moses (peace be upon him) was buried there. Needless to say I had to focus every time I mentioned this mount, cause replacing B with an M makes a lot of difference. And I’m back from a long vacation in Cairo, interrupted by another vacation in Jordan 🙂 Both were family oriented, one is to introduce Gigo to her family and the second is to be introduced to my Janbek extended family. Both elhamdlelah went great! Now I’m back to daily life in Tirana and getting reacquainted with the heat wave. I want to fully invest in my scarce spare time and to exploit my last year in Albania. Since I was a little kid, weight is a huge issue for me. It culminated when I was in my last year of Thanaweya Amman. I weighed back then more than when I was 9 months pregnant! After leaving school, I started shedding some wight, maybe because of the new daily schedule, but I was still way over wight. Then I started working, and I got busier by day, and seeing friends by night, plus following the activities I was immersed in. At that period, I was just too busy to think about food, and bit by bit I became more confident in my body. Plus, at that period I started avoiding junk food with all my strength, though it was hard considering the Egyptian standard work environment and socializing. This was the best period of my weight problem, and for a short period of time, I was finally able to buy clothes that looked good on me and actually fit. Then I got to know my husband, and as we were working together, during the dating period we went out nearly every day, and in less than a year I gained -gulp- more than 10 kilos! That’s why I was very conscious about my weight during pregnancy, I couldn’t afford gaining a lot of weight. Not just it didn’t look good, or that it will affect my self confidence negatively, it could have had physical complications I really didn’t want to get involved in. It’s enough that my OB referred to weight every time he had troubles viewing the baby by the ultrasound, and he also said that the fat affected the healing process of the stitches. And now, thank God I lost the kilos I gained during pregnancy, BUT I am still suffering from obesity. And I really want to lose these extra kilos, and feel better about my body and myself. Talking about it on my blog may encourage me to stick to my plan and eventually reach my goal. Hopefully! For the past few months, I abstained from unhealthy food, and tried to maintain a healthy menu. But still, I go down 2 kilos, then up again, and I really hate this yo-yo effect. Recently I started a food diary, by just putting down what I consumed, no matter how guilty I feel about it, made me reconsider my diet. I discovered that I consumed way too much fruit than I needed to compensate on the no-sugar rule I started following few weeks ago. So my first idea was to cut on fruits to one or two a day. I also found that my idea of having 5 small meals, was transformed to having 2 big snacks between normal 3 meals, and this obviously didn’t have the results I was hoping for.. So now I was to keep up my food diary, continue on abstaining from white sugar, and limiting my fat intake and I plan to choose whole wheat instead of the refined grain. My target is to lose 5 kilo in order for my BMI to go lower than 30 (to be removed from the Obese category), and then I will start to gradually lose another 10 kilos and try to maintain it. Finally few days ago I started to take my bike for a ride and discover the other sides of Tirana. What really encouraged me was the sunny weather after days of rain, and knowing that there was a paintings exhibition featuring one of Picasso’s work. 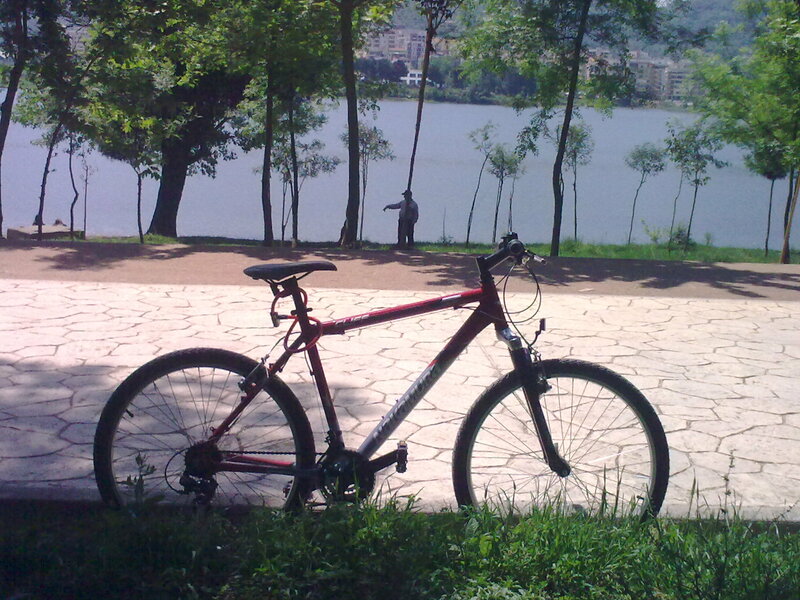 So I took my bike, and headed first to the artificial lake, cause I went there only once. It was truly lovely. Lots of trees, and nice weather, people walking and jogging. Noticeably, most of the people there were either moms pushing poussettes, or elderly couples walking side by side, plus some joggers. Then I headed for the National Historical Museum, thinking that this is where the exhibition will be held, cause there was big signs there for the Italian Albanian cooperation event which supports the exhibition. But I found that the National Museum had a small gallery for the Italian cooperation thingie, featuring some old photographs by the Marubi family, plus others. I was very happy cause I am putting in mind to go all the way to Shkodra to visit the atelier of the Marubi family and maybe find the photo book I heard about. Also, I took the opportunity to visit the museum itself for the first time. Even though it is strategically positioned in the exact center of the capital, and its huge facade encourages, I was literally the only visitor in the museum! I saw during my round exactly 6 employees (all women)! The souvenir shop is actually nice and has stuff different from the other shops in Tirana, good for a souvenir hunt if I didn’t have the time to go to Kruja. 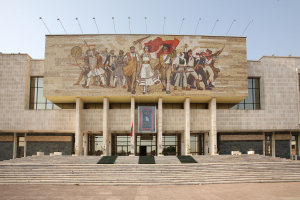 The next day, I headed to the National Art Gallery to check out the exhibitions that was held as part of the Italian Albanian Cooperation festival under the slogan “Two Nations, One Sea, One Friendship”. The artworks are part of the collection “Ca` La Ghironda” of an Italian art collector Dr. Francesco Martani. They are actually 2 exihibtions, one titled “Classic Splendours” featuring works from the 16th and 7th century, of artists such as Francesco Raibolini, Guido Reni, Annibale Caracci and il Guercino. From a quick glimpse from their wikipedia pages, it is noticeable that all of them are from Bologna and their style is Baroque. The second exhibition is titled “Moods of the 20th Century” and featured works by Francis Bacon, Pablo Picasso, Kazimir Malevich,, and others. I am not an art connoisseur by all means, so my opinion here is just instinctive. 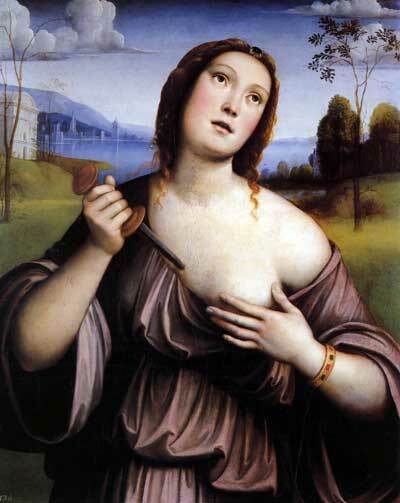 Classics are really nice and talks to you, but the modern paintings are just too artistic to be digested! For me most of them were just “shakhabeet” of a 3 year old kid or water colours spills on plain papers! And even the Picasso painting I saw, was not by any mean inspiring! I was especially intrigued by two paintings, one of them was just painted blue, that’s all! Not even different shades of blue, no, just one! The second painting was a yellow canva, with some diagonal cuts, and I was very surprised that my husband told me that it was actually very famous! For what?? another ordinary day . nothing special. yet. no special good morning calls. no sweet good night whispers. celebrating a year to remember. I heard that when you go to NY, do not expect it to be just like the movies, and that many people were disappointed with what they saw. For me I loved it. It was pretty hectic, crowded, noisy, fast-paced. Kind of similar to Cairo in some aspects. If you want good food, there are tons of restaurants. Wants culture? Tens of exhibitions and museums. Nature? you have parks. Partying? I won’t go through that, but I heard that it was niiice. It’s really nice to walk in the streets of Manhattan, only my feet hurt that I used the cabs. And without noticing it I discovered that I imitated the fast walking method of the New Yorkers. On average I used to walk something like 3 hours a day! Just thinking about it, makes my muscles ach. On the other hand, cabs were also fun. There is a screen featuring some news, and a GPS map showing the way. But when you ride more than a cab during the same day, the video seems annoying. Cabs in NY are way better that the ones in Washington. Only few months ago, cabs in Washington used to calculate the trip by zones, it was very complicated and expensive. Elhamdlelah, they changed the system to the normal metering. The day before I go there, MBC2 was showing “The Day After Tomorrow”. It was kind of funny to watch the streets I’ll be walking in in an icy atmosphere.